Grad school! Kids! Work! It all adds-up to little time to play concerts. 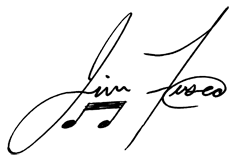 But, Jim will play a show here and there, so stay tuned to Twitter, Facebook, and right here on JimFusco.com for upcoming show dates! Saturday, March 12, 2016- Jim played a set of Beatles songs with the band Number Nine at the Broad Brook Opera House in Connecticut. Saturday, December 5, 2015- Jim hosted South Meriden, CT's "Christmas in the Village" with a half-hour set. Sunday, July 28th, 2013- Jim played a 45-minute set with 15 original songs at the Outer Space in Hamden, CT. Click HERE to see the video of the whole performance! 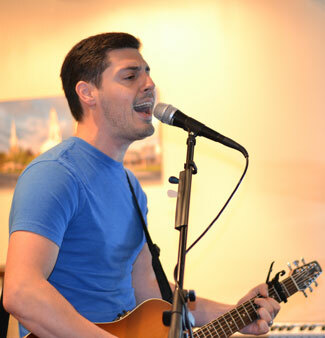 Friday, January 13th, 2012- Jim hosted the CD Release Party for his album, "Those Around Us" at Brother's Restaurant in Wallingford, CT at 7:00 pm. 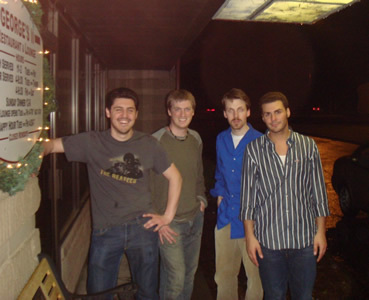 Saturday, May 16th, 2008- Jim, Mike, Chris, and Jeff rocked the lounge of George's II Restaurant in Wallingford, CT.
Saturday, April 12, 2008- Jim, Chris, and Jeff made their first ever live appearance together at Testa's Restaurant, 26 South Center Street, Southington, CT 06489. Wednesday, October 24, 2007- Jim and Chris played a preview show at On Broadway restaurant in North Haven, CT.
Thursday, June 22, 2006- MoU at the Webster Main Stage. Monday, July 24, 2006- MoU at Buried in the Beach on the boardwalk in West Haven, sponsored by WPLR Radio! Friday, March 31, 2006- The "Masters of the Universe" CD Release Party. 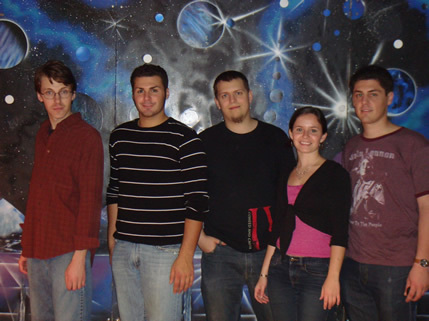 Thursday, January 19, 2006- Jim Fusco, with Chris Moore, Becky Daly, Mike Fusco, and Cliff Huizenga: "The Space" in Hamden. Thursday, December 1, 2005- Jim Fusco, with Chris Moore, Becky Daly, and Mike Fusco: Martini's Cafe in Orange, CT.
Thursday, November 17, 2005- Jim Fusco, with Chris Moore, Becky Daly, and Mike Fusco: Martini's Cafe in Orange, CT.
Thursday, November 10, 2005- Jim Fusco, with Chris Moore, Becky Daly, and Mike Fusco: Martini's Cafe in Orange, CT.
Thursday, November 3, 2005- Jim Fusco and Guests: Martini's Cafe in Orange, CT.
Saturday, July 30, 2005- The Half-Moon Cafe and Restaurant on the corner of North Main and Center Street (Stimpson Court) in Wallingford, CT.
Friday, June 24, 2005- The Half-Moon Cafe, Wallingford, CT- "Jim Fusco and 'Chris, Jim, and Becky'." 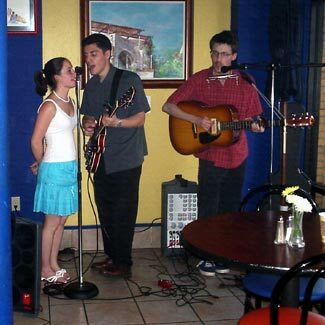 Thursday, June 16, 2005- The Half-Moon Cafe, Wallingford, CT- "Jim Fusco with Special Guest, Chris Moore." April 8, 2005- "Crossroads in Communication" event at Southern CT State University- Jim Fusco. September 19, 2004- "Static" at First Baptist Church in Wallingford, CT- "Chris, Jim, and Becky." 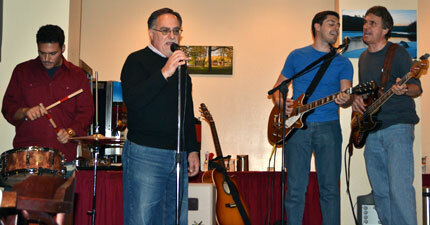 March-May, 2004- Open Mic Night at the Pine Loft Cafe in Berlin, CT- "Chris, Jim, and Becky" + "Jim Fusco and Chris Moore." Early 2004- "Static" at First Baptist Church in Wallingford, CT- "Chris, Jim, and Becky."